When implementing Proxy Services in Oracle Service Bus (old BEA AquaLogic Service Bus), it’s important to think about validation of request data. If your company uses Canonical Model, is very common to use on all your xsd entities elements with minOccurs=”0” to get full reusability on the model, however is hard to validate when a specific service operation needs that an element be mandatory, and it weakens the service contract. 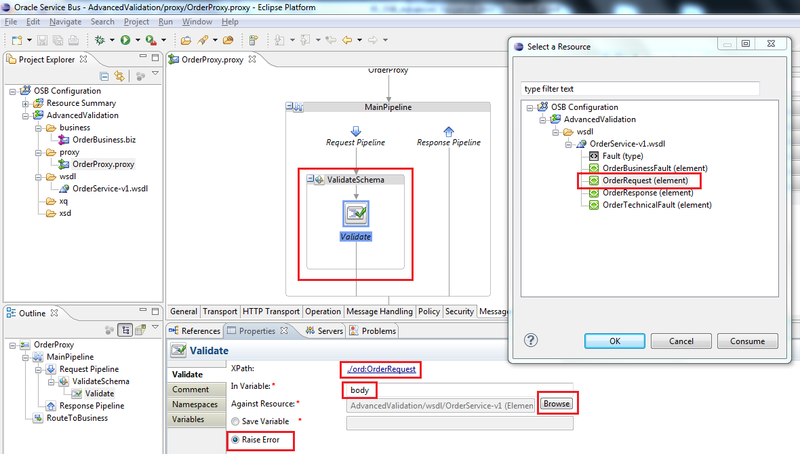 In this article I will show a good pattern that I use to do more advanced, business oriented validation in Oracle Service Bus using XQuery. 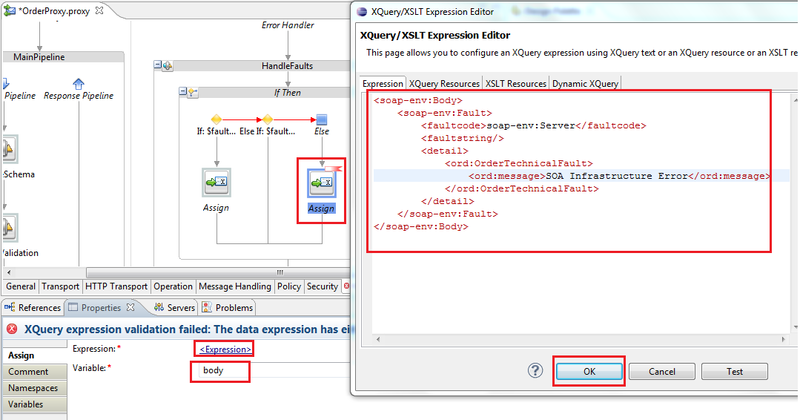 Note that deep XQuery knowledge is not in the scope of this article, for more in-depth knowledge about XQuery you need to google (a good start can be found at http://www.w3schools.com/xquery/default.asp). I will predict that the reader has basic XPath concepts to find some nodes in a XML instance (more at http://www.w3schools.com/xpath/default.asp). 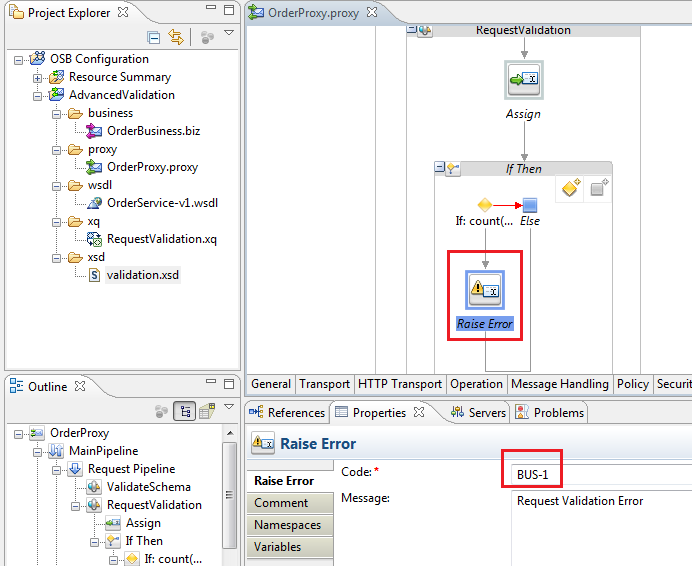 In this sample I will focus on the Proxy Service, so I will ignore any business-proxy-business transformations and the sample will show a simple Business Service virtualization through data by-pass, but implementing some complex validation on the request input that is the main objective of this article. 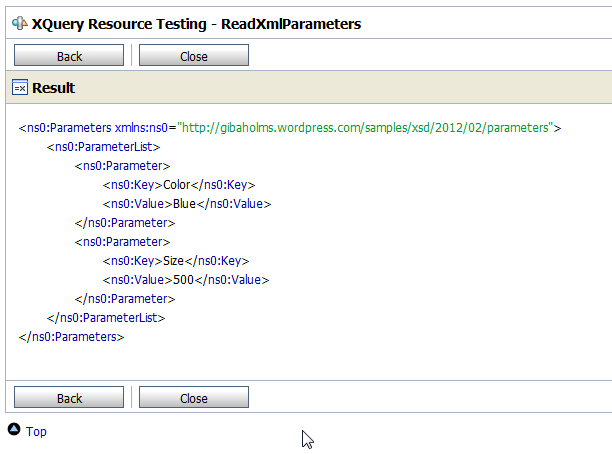 You can download the example artifacts in the links bellow this article. The sample simulates the use of Canonical Model entities which sets minOccurs=”0” all over the place, but we know that some information is mandatory to our execute order operation. 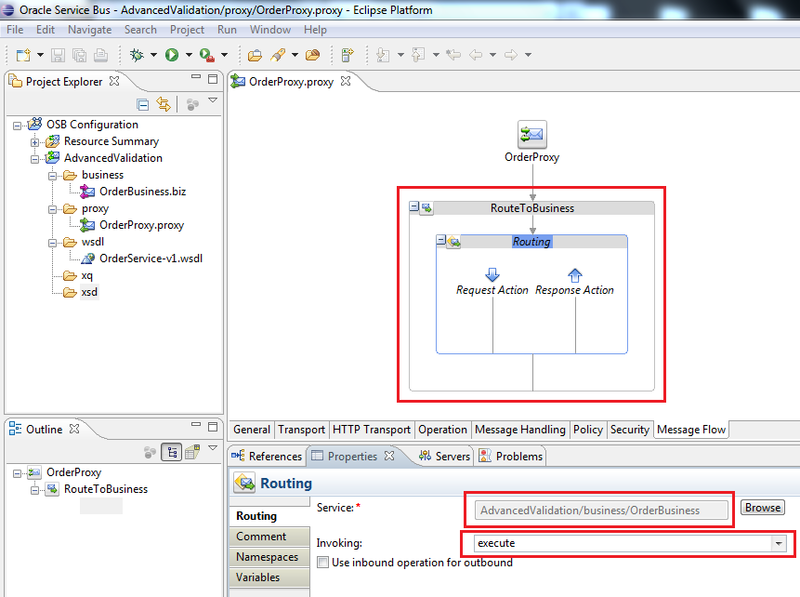 One Proxy Service named “OrderProxy” created from the OrderService WSDL, with a basic Message Flow that only routes the original request to the OrderBusiness in the execute operation. By now the focus will be the Proxy Service message flow. 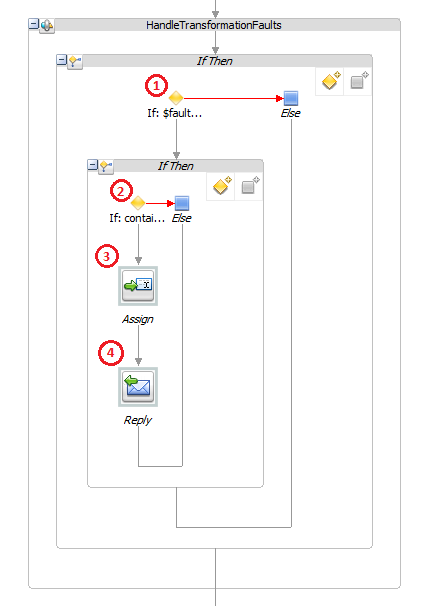 To start our robust validation let’s add the main pipeline pair and put the simple “Validate” action into the request branch, because the minimum expected is that the request message does comply to the XML Schema, and if don’t, the flow does not need to work anymore. 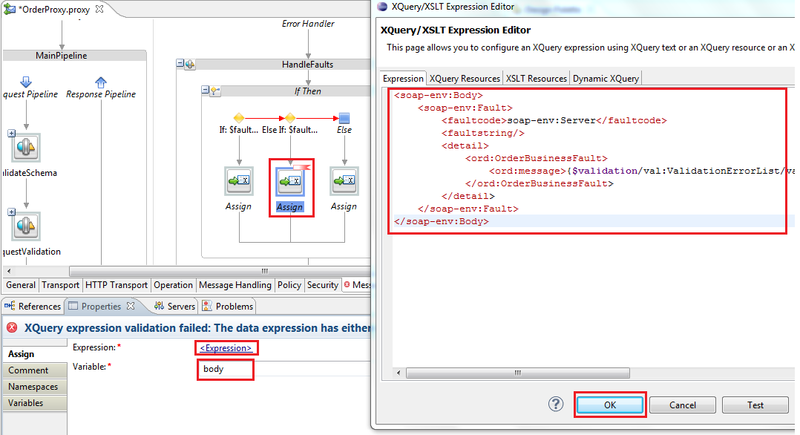 In the XPath select the OrderRequest input element in the wizard, in variable body against its XML Schema definition present into the OrderService WSDL. 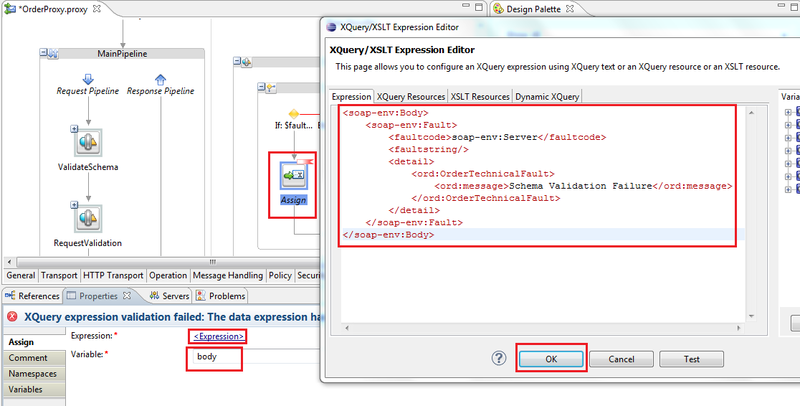 The next step is create the XQuery transformation file to do the validation and fill the previous structure. 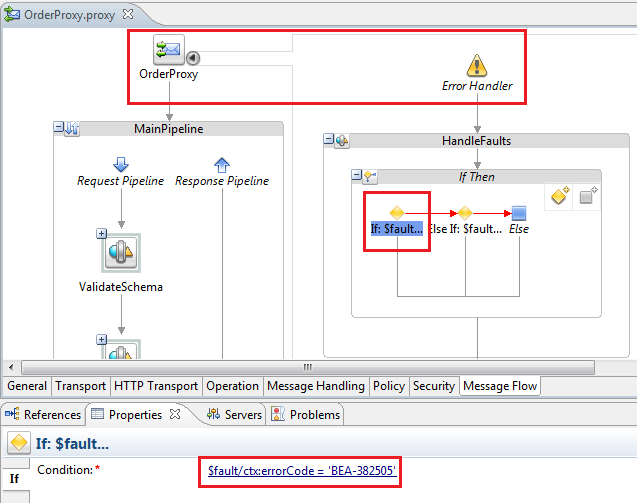 The input of transformation is the OrderRequest schema and the output is the Validation schema. 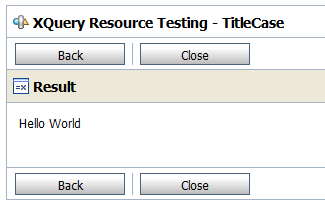 Now add an “Assign” activity to evaluate the validation XQuery against a newly created validation variable. We’ll use this variable in the error handler to gain access to the validation codes and messages. 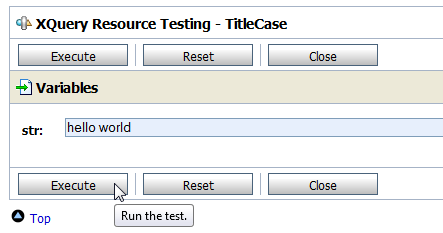 We put now an “IF-ELSE” control to check if exists any validation errors. Don’t forget to add the validation xsd target namespace into “val” prefix. Then we raise a custom error with the code of our choice “BUS-1”. Note that this code will be used to capture the error in the handler, just remember that code. Now the pipeline is finished. 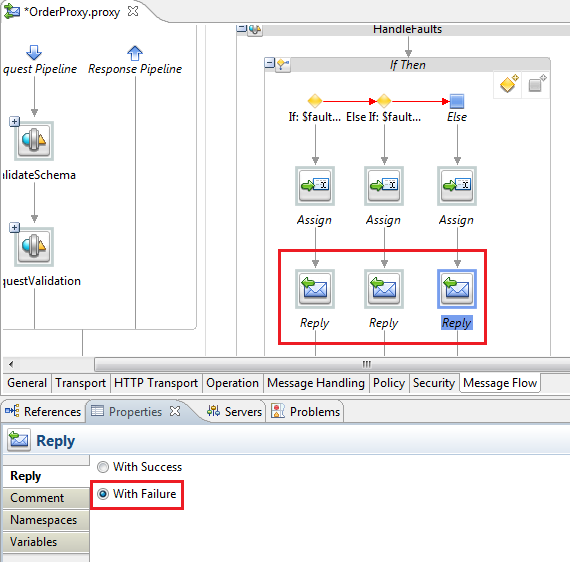 We now concentrate the fault treatment in a single error handler associated to the entire flow, adding a “IF-ELSE” action to act as a switch, verifying which of the code is present in the “fault” variable and manually throwing the typed faults declared in our service contract (OrderBusinessFault and OrderTechnicalFault). Obs. : the code “BEA-382505” refers to the internal OSB code that is used for “Validate” action errors. Well done! 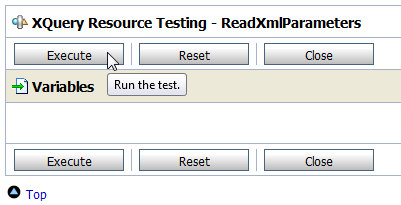 You can open the OSB console and do the tests in the Proxy Service. Input some data and observe the results. 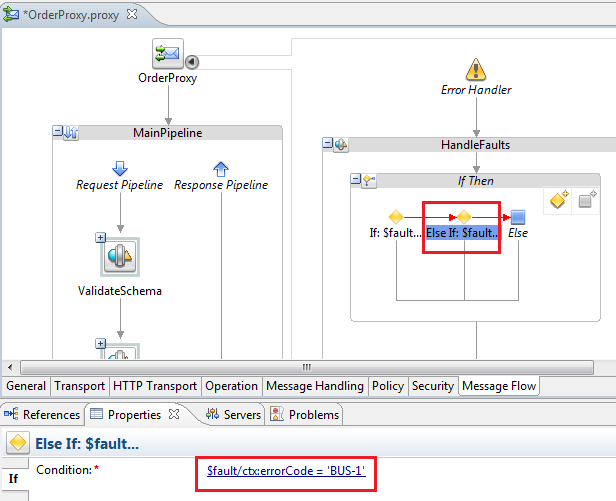 Don’t forget to start the Mock Service into SoapUI and point the Business Service endpoint to the mock address. An easy way to simulate a generic technical fault is stopping the mock service, crashing the business service like it was “unavailable”.Now I hope this article has helped you to doing more complex validations beyond the limits of xsd into Oracle Service Bus 11g.